Humans throughout time have achieved great things, things that inspire movies and songs to be written about them. There are no shortages of memorials dedicated to the inspirational, brave and heroic things every day people have done in order to remind us that we all have the power to do something that makes an impact. This honor isn’t relegated solely to humans, however. For as long as humans have been doing memorable deeds, animals have been right there doing them too. Sometimes it’s something simple, like being a beloved companion who brought joy to their family’s life. Sometimes it’s something unbelievable, like saving 40 planes during a war. Whatever the case may be, these animals did something that affected the world around them and the memory of it will stand the test of time. By paying tribute to these beings and acknowledging the things they did, we also acknowledge that their lives have value. Animals are capable of bravery, selflessness, love and loyalty, which is definitely worth remembering! By honoring that, and honoring them, we are reminded that they deserve the respect and dignity en memoriam that they displayed in life. 1. This memorial on Guam honors the WWII Devil Dogs, 25 marine dogs specially trained in jungle warfare. 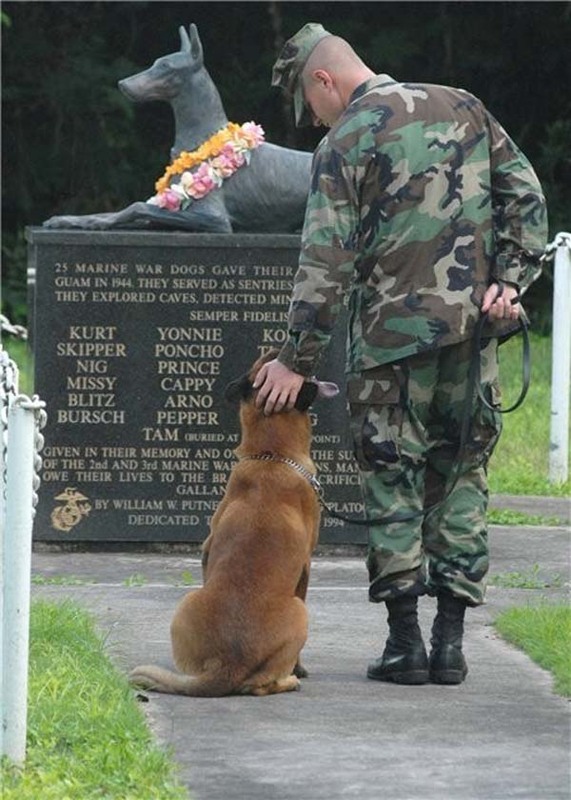 It stands by the War Dog Cemetery, where the dogs were all laid to rest in a place of honor after their passing. 2. 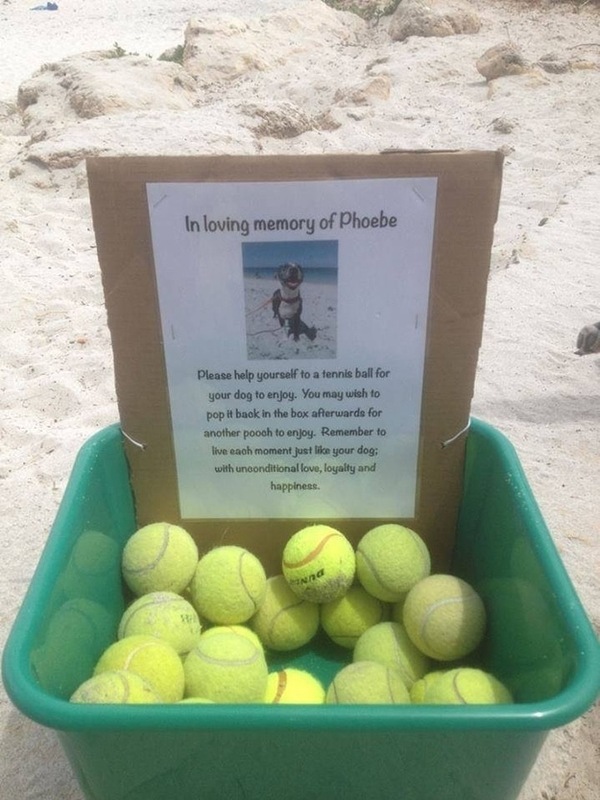 An Australian family kept the spirit of their beloved Phoebe alive in a simple and playful way that any true dog lover could appreciate. 3. Honoring the dogs and soldiers that they served with, the West Coast War Dog Memorial stands in Riverside, California. The base of the memorial is surrounded by tiles with tributes to individual dogs, marked with a single black paw print. 4. 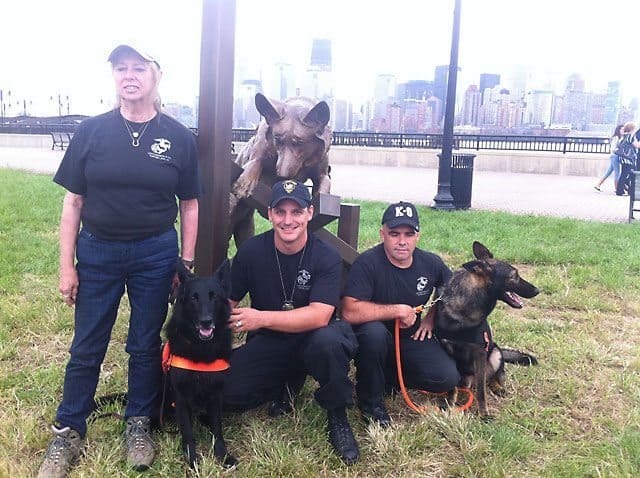 Located in Jersey City, NJ, this memorial honors the working dogs who searched tirelessly alongside their human handlers for victims of the 9/11 attacks in New York. 5. A part of the Franklin Delano Roosevelt Memorial in Washington, DC depicts the president alongside his beloved Fala. 6. Dedicated to all animals that served alongside the British Commonwealth and Allied forces during wars fought in the 20th century, the Animals in War memorial stands as a tribute in London. 7. Emily the Cow escaped a slaughterhouse in 1995 and lived out her days at the Peace Abbey. She was interred in Sherborn, MA with a memorial to her and all animals still subject to factory farming. 8. A roadside memorial in Cape Town, South Africa uses wire brushes to scratch the surface clean along the side of the Green Renaissance Highway to remember the loss of rhinos in the area to poaching. 9. Smoky was a 4-pound Yorkshire terrier who transported communication cable through a drainage pipe under an airfield in World War II. Her actions protected 4o planes before she retired to live her life as therapy dog. 10. Marking her favorite place to sit, Senator Capitol Kitty is remembered with a permanent plaque outside the capital building in Sacramento, CA where she lived as a well loved stray for 13 years. It is sad and makes me angry that human beings feel they have the right to involve innocent animals in their stupid and violent wars and issues. We make them do our dirty work and send them into situations that would be too dangerous for humans because , you know…animals are disposable. Its a sick and despicable speciesist attitude. Stop the use of animals in human conflicts and problems! Yes…this should not be happening. We should not be involving innocent animals in our stupid, warlike and violent problems.